The Chevrolet Malibu nameplate has been around for a long, long time, in all kinds of shapes and sizes. Once a big car, the Malibu has in recent years been Chevrolet's bread-and-butter sedan, fitting in the lineup just below the larger Impala, which is itself a downsized version of the old full-size Impala. Today the Malibu competes directly against the other midsize sedans on the market, among them the Honda Accord, Toyota Camry, Nissan Altima, and Ford Fusion. The 2008 Chevrolet Malibu is an all-new model. This edition of the Malibu shares its underpinnings with the other GM cars mounted on the Epsilon front-drive platform, including the new Saab 9-3, the new Saturn Aura, the Pontiac G6, the European-market Cadillac BLS, and the German Opel Vectra. That's a fine group of cars to be associated with and the Malibu is expected to be the biggest seller among them. Chevrolet says it has modified the platform with some extra strength and extra steel in the central tunnel area and the bodysides to help quiet the car and improve its crash performance. More quiet was added with composite inner fenders, thicker glass, and sprayed-on sound insulation throughout the body cavities. Still more quiet was engineered into the induction system, to make the engine sound powerful but quiet at full-throttle and during downshifts. It's a bigger car inside than the previous model, but it's smaller on the outside, although the design makes it look even longer than the outgoing car. The Malibu will be sold on its obvious exterior glamour, its initial pricing, and its good fuel economy, with EPA ratings of 22/30 mpg for the base 4-cylinder and 4-speed automatic, 17/26 mpg for the V6 engine and 6-speed automatic, and 24/32 mpg for the so-called mild Hybrid. All models are four-door sedans with front-wheel drive. We found the Malibu to be a smooth, comfortable sedan with plenty of power and responsive. It strikes a nice balance between well-controlled handling and a smooth ride. Overall, the new Malibu feels smooth and refined and pleasant to drive. The cabin is nicely designed, attractive, and everything is easy to operate, and the seats are comfortable. In short, we think the Chevy Malibu stands up well when held against the Toyota Camry and Honda Accord gold standards. Choosing among them largely comes down to nitpicking, splitting hairs and personal preference. Camry and Accord may have an edge on resale value, but they're also likely to come with higher price tags. In any case, we don't see the gap between this Chevrolet and the imports that we used to see. 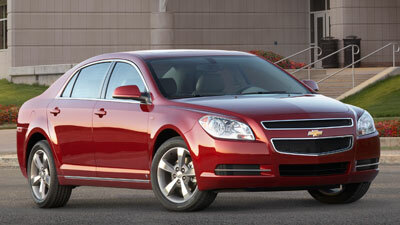 The 2008 Chevrolet Malibu range includes the LS ($19,995), 1LT ($20,995) 2LT ($22,635), and LTZ ($26,995), plus the Hybrid ($22,790). All prices are MSRP and include a $650 destination and delivery charge; prices can change at any time without notice. The Malibu LS comes with a 2.4-liter four-cylinder engine and four-speed automatic transmission. The base model also comes with electric power steering, to saved drag on the engine, while the V6-powered models come with hydraulic power steering. LT models come with the 3.6-liter V6 engine and six-speed automatic transmission along with StabiliTrak yaw control, 17-inch wheels and tires, dual exhausts and manual shift control. LTZ adds 18-inch alloy wheels and tires, fog lights and clean-lens LED taillamps, and comes with a long list of standard equipment items, plus and a higher-capacity six-speed automatic. The LTZ will also be available with the four-cylinder engine and a six-speed automatic. The Hybrid comes in an LT-level of trim with special 16-inch low-rolling-resistance tires. Options include a power sunroof, remote starting, power adjustable pedals, upgraded interiors, and an upgraded eight-speaker, 210-watt entertainment system. The safety package is comprehensive, with front, side and curtain airbags, ABS, traction control, tire pressure monitoring. StabiliTrak electronic stability control comes standard on LT, LTZ, and Hybrid models and includes Brake Assist. Chevrolet has followed an industry-wide trend with the Malibu, stretching the wheelbase a full six inches compared to the previous model, to get more interior room for the occupants and a smoother, quieter ride, with an overall length that's only three inches longer, which means the all-new body has the preferred wheels-at-the-corners look. The Malibu looks masculine, brawny, yet clean and crisp. In our opinion, this is one of the best overall designs that GM design boss Ed Welburn has supervised since he's had the top design job. The new body design is bold, long and sleek, with an especially appealing roofline that looks like it belongs on a luxury car. The bodysides are completely clean and uncluttered, and the twin round taillamps pay homage to the Corvette. The dual-port grille is a contemporary Chevrolet design cue. We think it works better on the Silverado, but it gives the Malibu a distinctive look, and distinction is the goal of the midsize sedan designer. Look closely and you'll see tiny bowtie emblems imbedded in the headlights, one of several small surprise-and-delight features the designers included in the hope owners will discover them one pleasant day while washing the car. Malibu rides on the Epsilon platform, with MacPherson strut front suspension and multi-link rear suspension with front and rear stabilizer bars of varying diameters, depending on model. The four-cylinder models will likely represent 70 percent of sales. The mid-level LT trim levels are expected to be the most popular, say GM executives, though the entry level LS-2 is also expected to be popular. Naturally, our favorite is the LTZ, perched at the top of the line. The 2008 Chevy Malibu cabin is beautifully done, with tight fits, no gaps, and everything within easy reach and easy to operate. The instruments are very easy on the eyes. The most noticeable interior feature of the new Chevrolet Malibu other than the new roominess front and rear is the dual-cowl dashboard and instrument panel layout inspired by vintage Corvettes. This design is brought into the 21st century with wood and metallic trim and a very pleasing blue-on-white instrumentation graphic treatment that's flooded with blue light at night. Less noticeable are thoughtful features such as the ambient lighting. A feature associated with expensive luxury cars recently popularized by Mercedes and BMW, ambient lighting helps the driver and front passenger find secondary controls and items around the center console. A cubby on top of the dash is convenient for wallets and such, a useful feature Subaru has used for years. Cloth, suede and leather interior options are available. The standard interiors are single color, but several new two-tone interior combinations are available, including a dramatic black-and-saddle leather combination that's very attractive. We found the leather seats in the LTZ quite comfortable. Piping in a contrasting tone dresses them up. The front bucket seats are somewhere between sumptuous and luscious in the way they look and the way they sit, very comfortable and supportive. The stretch in wheelbase affords each occupant plenty of room, and there is ample headroom and legroom in the rear compartment for six-foot-plus passengers. The backs of the front seats are dished out to add knee room. The rear seatbacks flip down to provide a pass-through to the trunk. The new cabin includes a dashtop storage bin, door cubbies, and seatback pockets, standard ambient lighting for the overhead console and door-pull pockets. We've never cared for the look of rolled-up sliding covers on center consoles due to their ability to attract crumbs. Overall, the Malibu interior is attractive and comfortable. The quality of the interior materials is good. It doesn't bowl you over but nor does it reek of cheap plastic. We think it compares well to the cabin of the all-new 2008 Honda Accord. The quality of the hard plastic on the lower dash in the Chevrolet isn't as nice as the material in the Honda, and the material on the steering wheel hub is a little nicer on the Honda, but it's still nothing to behold. The Chevrolet has an attractive leather shift boot on cars with leather interiors is not found in the Accord. Every Malibu comes with XM satellite radio and the latest version of OnStar with Turn-by-Turn navigation. However, there's no GPS navigation system nor is there a back-up camera. Chevrolet says people prefer to use their portable GPS units and relatively few want to pay for an OEM navigation system, but we're a little skeptical of this. Big knobs and buttons and an elegant design make operating audio and climate functions easy. In fact, we found it easier and less confusing to make adjustments in the Malibu than in a comparably equipped (non-navi) Honda Accord; the Honda seems less intuitive and convenient. Unlike the Honda, the Chevrolet has the audio controls at the top, better because people tend to fiddle with their stereos more than their temperature controls. Climate controls in the Malibu are very easy to operate utilizing big knobs for fan and vent modes and simple, clearly labeled buttons. Honda splits the climate controls up, forcing the driver to examine them more closely before pressing a button. In short, the Malibu audio and climate controls are, in our opinion, better than the controls on the Accord. Window switches are conveniently mounted on the doors. Redundant controls on the steering wheel are available. We drove all three versions of the new Malibu, the four-cylinder four-speed automatic, the hybrid, and the V6 with the six-speed automatic. Most of our time was spent in the V6, however. The 2LT we drove was very pleasant, indeed. Acceleration was good, if not sparkling, with only a little over 250 horsepower from the V6 engine. Some cars in this class have 20-25 more horsepower than this engine offers, but we never felt there was a lack of power here. The new six-speed automatic was quick to shift, up and down, smooth, lurch-free and quiet. The engine, which has nine different sound attenuators in the air intake system, never sounded anything but powerful and smooth. In fact, everything about the car we drove was quiet and smooth. The suspension soaked up rough Mississippi cotton-farm roads with aplomb, and kept the car straight and flat without a lot of pitching and body roll. The steering was reasonably quick and precise, but without much real road feel, although better than previous models of this same car. With the V6 engine, the driveline exhibited torque-steer at full throttle. Stand on the gas when turning at low speed and you'll feel a tug on the steering wheel. Braking action and performance was on par with anything else in the class of vehicles and trustworthy in panic situations. The hybrid is considered a mild hybrid and uses a belt-alternator-starter, or BAS system, to stop and start the engine when needed. It shuts down completely at stoplights, and can add 3-4 kilowatts or about seven horsepower to the gasoline engine's output when needed. The LS comes with an Ecotec 2.4-liter four-cylinder engine and the old four-speed overdrive automatic transmission, an economical alternative that promises cheap insurance and low operating costs. The base model also comes with electric power steering, to saved drag on the engine, while the V6-powered models come with hydraulic power steering. The all-new Chevrolet Malibu has all the size, room, features and conveniences a middle-of-the-market sedan needs to be competitive, and the fits and finishes inside and out are world-class. They have indeed built a car we can't ignore. We think the new Chevy Malibu stands up well to the best in its class, including the Toyota Camry and Honda Accord. NewCarTestDrive.com correspondent Jim McCraw filed this report after test driving Malibu models around Memphis and down into Mississippi; with Mitch McCullough reporting on the Malibu LTZ from Los Angeles. Head/hip/leg room, f: 39.4/53.0/42.2 in. Head/hip/leg room, r: 37.2/52.1/37.6 in. Cargo volume: 15.1 cu. ft.